Ramsey Hunt Syndrome [RHS] is a peripheral facial nerve palsy caused by an infection with the virus Varicella Zoster virus. It is generally accompanied by a rash (which can be painful) in the area of the ear and/or the mouth; however, occasionally there will be no rash visible. The auditory nerve may also be involved, leading to hearing and balance effects. The syndrome is named after Dr J. Ramsey Hunt, the physician who first described the syndrome at a meeting of the American Neurological Association in 1906. He subsequently published his article on the subject in 2007. When compared with Bell's Palsy, RHS has a higher incidence of incomplete recovery with longstanding sequelae. RHS is caused by reactivation of the varicella zoster virus (the virus which causes chicken pox) within the sensory ganglion of the Facial Nerve, the 7th Cranial Nerve. As the 8th Cranial Nerve, known as the Auditory Nerve or the Vetibulocochlear Nerve, lies next to the sensory ganglion of the facial nerve within the facial canal, both nerves are usually involved. The most common presenting feature is a moderate to severe earache (otalgia). This is accompanied by facial palsy. The otalgia may occur at the same time as the facial palsy, or the palsy may occur a few days after the onset of earache. A painful red rash with blisters (as in the illustration) commonly appears; the rash can be on the pinna of the ear, within the ear canal, or inside the mouth. In addition the patient may have general signs of a viral infection, including fever, headache and general malaise. A number of patients suffer from ipsilateral hearing loss, and/or tinnitus (ringing/noises in the ears) and/or balance difficulties including vertigo. 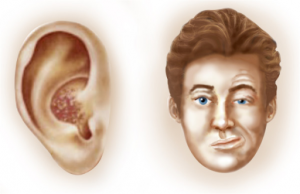 The diagnosis of RHS is a clinical diagnosis, made when the combination of ear pain, a herpetic rash in the ear or mouth and facial palsy occurs; however, virological studies can be used to confirm the diagnosis. MRI scanning can be used to exclude other causes of facial and auditory nerve dysfunction (such as Acoustic Neuroma). Bell's Palsy - this is the most common cause of sudden onset, non-traumatic facial palsy, and can be differentiated from RHS by the absence of severe otalgia (only mild pain in the region of the mastoid usually occurs in Bell's Palsy) and the absence of vesicles and involvement of other cranial nerves. Corticosteroids and antiviral medication are the 1st line treatment for RHS, providing the best results when treatment starts within 72 hours of onset of symptoms. Patients who suffer from vertigo may also benefit from vestibular suppressant medication, and analgesia may be required to control the ear pain. Physiotherapy management of the facial paralysis or weakness is as detailed in the section on Facial Palsy. It is also important to provide information on care of the eye in order to prevent formation of corneal ulcer: see advice page on Dry Eye. Referral to an opthalmologist should be considered. RHS patients with long term facial palsy may also start to experience dental problems: see advice page on Dental Issues in Facial Palsy. ↑ Cai Z1, Li H, Wang X, Niu X, Ni P, Zhang W, Shao B. Prognostic factors of Bell's palsy and Ramsay Hunt syndrome. Medicine (Baltimore). 2017 Jan;96(2):e5898. ↑ Hah YM, Kim SH, Jung J, Kim SS, Byun JY, Park MS, Yeo SG. Prognostic value of the blink reflex test in Bell's palsy and Ramsay-Hunt syndrome. Auris Nasus Larynx. 2018 Oct;45(5):966-970. doi: 10.1016/j.anl.2018.01.007. Epub 2018 Feb 3. ↑ Murakami S, Hato N, Horiuchi J, Honda N, Gyo K, Yanagihara N. Treatment of Ramsay Hunt syndrome with acyclovir-prednisone: significance of early diagnosis and treatment. Ann Neurol 1997; 41: 353–7.